Innovative mass communications expert with nearly 10 years of leadership in digital development, account and project management, and content creation. Expert in effective communication practices to ensure accurate comprehension. Strong competency in cultivating relationships with internal and external stakeholders. Invested in taking ownership of assignments and outcomes. Highly organized, adaptable, and fully capable of prioritizing and delegating responsibilities. Bilingual in English and Spanish, with some understanding of Portuguese. We are executives, geeks, marketers and hackers united to create marketing strategies that combine great creative and technologies to connect global brands with people in ways that will move the business needle. Lead in project management for large-scale productions for agency’s entire client roster, and in resource management with internal and external resources. Responsible for agency awards entry and assets assignment throughout the year. Social media, video production, and activation development for multi- category clients and potential new business across all markets: Netflix, HMD/Nokia, Güitig, Gatorade, Pepsi, Ocean Spray, Tropicana, Marriott International, Joe DiMaggio Children’s Hospital, Lifefy. One of the few Facebook Marketing API partners in the world. Nobox provides solutions backed by a multi-disciplinary team, focused on creating technologies and strategies that enable leading brands to connect with consumers in relevant ways. Digital and tactical production development for multi-category clients within GM, USH, and LatAm markets: Mozilla, PlayStation, Copa Airlines, A&E, Memorial Healthcare System, P&G, Colombina, TEDxMiami, Triple-S, Lexus. Contributed strategic and data-supported analysis for the successful delivery and optimization of complex web/mobile applications and campaigns, including online media, email marketing, social media integrations, and analytics. Founded in 1976, Zubi Advertising is a full-service and independently owned Hispanic agency in the U.S. with a proven 36-year track record of award winning U.S. Hispanic Market branding campaigns. Managed strategic and tactical efforts with American Airlines regarding all U.S. Hispanic communications and promotions. Provided leadership for digital account components, including client marketing objectives, internal creative development, project management, coordination of online and social media planning, and placement with internal/external stakeholders. Supported account supervisors with budget and estimates maintenance, internal and external coordination with account teams and vendors, above-the-line/below-the-line tactical coordination, and liaison with client sales office. Nobox provides solutions backed by a multi-disciplinary team, focused on creating technologies and strategies that enable leading brands to connect with consumers in relevant ways. Project Manager • August 2008 - June 2009_ Managed the agency’s daily activities, ensuring timely progress of project for clients: Copa Airlines, Toyota de Puerto Rico (Lexus, Toyota, Scion), Mozilla, Lexus Español. Responsible for client service and project management of Lexus Español website and marketing strategies for new projects. Established an effective workflow between the production team, Team Leaders, and Account Executives. Ever since I was a kid people always told me, your dreams are too big you need them to fit through a door, but after all this time and seeing my big dreams come to life I understood all I needed was an excellent PM and boy did I got her. Zaida to me is a dream enabler she is a tireless worker and she will go above and beyond to make sure your biggest projects come to life. She has been behind all my great successes, such as “Soraya In Litchfield,” “Paquita Sings To Pablo,” and all the many surprises that are yet still to come. She is a sweetheart a trooper and anyone will be so lucky to have her as a team member, she does not only does her job but she will also put the creative hat from time to time to help you find solutions. Impeccable. As an Account Executive, as a Production Manager, as a person. I've worked with Zaida for over 3 years and I've learned so much from her. Her knowledge of the interactive medium is vast and her professionalism is incomparable. I look forward to working with her again. She makes my life easier and more pleasant. I've had the privilege of working with Zaida since she began in Nobox and I can tell you that she’s an incredibly versatile online marketing and development resource. She can manage projects and clients effortlessly and always has excellent results. Her understanding of web projects and the online business make her a well rounded Internet based professional. Zaida is also an incredibly creative person that can bring great solutions and ideas to the table. I would definitely love to work with her again and strongly recommend her. 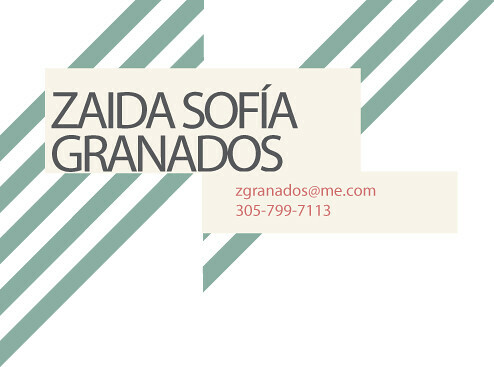 Member of "The Association for Women in Communications"
Zaida S Granados is maintained by ZGran. This page was generated by GitHub Pages using the Cayman theme by Jason Long.